Majors Home Improvement is proud to install sunrooms for homeowners in Milton, Florida, and all surrounding communities. We are a local, family-owned business that has served residents of the area since 1997. We hold an A+ rating with the Better Business Bureau, which we have maintained for many years due to our commitment to using quality products and providing expert installations. 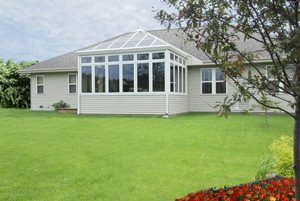 Sunrooms are fantastic for maximizing the overall square footage of homes. With a sunroom installed at your residence in Milton, FL, you’ll be able to enjoy the beautiful views of your backyard without contending with common outside nuisances, like pesky bugs, inclement weather, and harmful UV rays. You will be able to host parties without worrying about a sudden rainstorm disrupting your gathering, relax with a book on a lazy weekend morning without fretting about sunburn, and even enjoy a meal with a view without also dealing with insects buzzing around your food and drinks. Contact Majors Home Improvement today to learn more about the sunrooms we install for homeowners in Milton, FL, and all neighboring communities.